Billy Ray (Murphy) and Louis (Aykroyd) are, for all intents and purposes, polar opposites. Louis is a powerful investor who enjoys the finer things in life, including a large mansion and a job at a prestigious firm that affords him all of life's luxuries. Billy Ray, on the other hand, is a small time con man who has a scheme for every occasion but, more often than not, his cons end with his incarceration. His latest con has also landed him in jail, after a misunderstanding with Louis when the two accidentally collide. Enter Randolph (Bellamy) and Mortimer (Ameche) Duke, a pair of millionaire brothers who also happen to be Louis' employers. The two wager a bet after Billy Ray gets out that if Billy Ray and Louis were to trade lives, they would each adapt to their surroundings and turn their lifestyles in opposite ways. For instance, would Billy Ray become rich and powerful, and would Louis in turn become a criminal after spending time on the street? 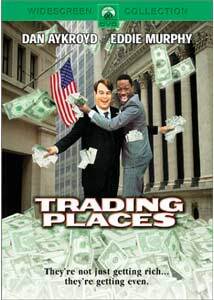 Trading Places is that rare sort of comedy, one that alternately makes you laugh while at the same time bringing up ideas and situations that are entirely unique. The idea of class structure and race, or nature versus nurture, is far from the typical humor found in lighthearted films and this is perhaps what propels Trading Places into the upper echelon of screen comedies. What is more admirable about the script by writers Timothy Harris and Herschel Weingrod is that they never ask the viewer to like either Billy Ray or Louis over the other. This results in a masterstroke as when the two ultimately pair up late in the film, it is believable rather than absurd. The film is relatively restricted to this central plot device, which creates a sort of lull in terms of excitement until an unneeded resolution occurs. The beginning of the film lays the appropriate ground work in terms of plot and character development, but after we see the direction the picture is going and what exactly the motivations of the characters are, it delves into a thirty-minute section that feels detached from the overall tone. The finale is also a problem, as Trading Places into revenge and silliness, leaving behind the sharply observed social study that was promised from the ingenious start. Directed by John Landis (who is forever guaranteed a place in history for making Animal House) does a fine job in his direction, but given that he has never been an overly visual director, anything out of the norm for him is a compliment. Aykroyd and Murphy give performances that they have rarely matched since, each doing a very nice job of playing what are essentially dual roles. In supporting performances, Jamie Lee Curtis, Ralph Bellamy, and Don Ameche each turn in nice work. Image Transfer Review: The 1.85:1 anamorphic transfer for Trading Places is impressive in that, for the age of the film, the transfer shows no startling traces of wear. Aside from some print flaws throughout, the transfer generally looks great with nice sharpness and detail, but the film looks soft in the outdoor sequences around Philadelphia. Trading Places is not a visually extravagant film, so the colors seem adequate. Edge enhancement does become noticeable several times in this transfer. Audio Transfer Review: The Dolby Digital 5.1 mix for Trading Places is perhaps one of the more boring tracks I have heard in recent memory. The only speaker showing any real activity is the center, which creates nice and clear dialogue. The surrounds can faintly be heard providing the musical score. Extras Review: No extra features are included here, which has become a sort of standard on Paramount catalog titles. Twenty chapter stops are available from static, themed menu screens. Score!